This is an upgraded Book of Shadows and Light, with more content and more features than my original free Liber Umbrarum et Lux app. Traditionally, one of the tasks of a new witch is to write out her own Book of Shadows. She would copy this by hand from the Books of her tutor, or her Coven priestess, or others in her Coven. The witch then continues to add to her Book as their experiences and knowledge grows. 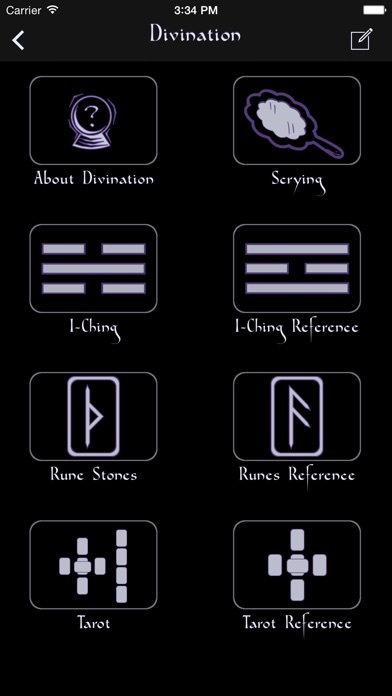 Transcribed from my own Book of Shadows, this universal app looks and works great on the iPad, iPhone and iPod Touch. The content is organized by sections and subsections, including Rituals, Consecrations, Spells, and more. Providing a full working basis for anyone familiar with or just getting started in the Craft, you are also able to add your own entries in every section and even remove existing entries as desired. Full customization means you can make this your very own Book of Shadows. 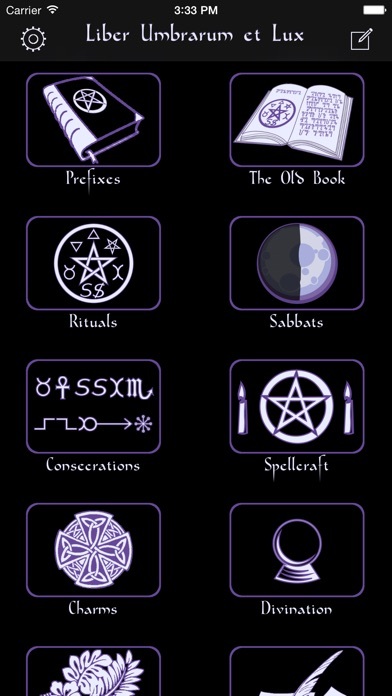 As you use this app and progress in the Craft, it evolves into your own Book of Shadows, growing and changing with you. But I would love to be able to make adjustments to the Tarot reference to update it to my companion for my deck. I like how it slides for easy finding but can’t add too it. I love all the aspects of this app, EXCEPT it does not keep accurate Sun and Moon placements! This is a huge issue for ALL of us Wiccan/Pagans, is it not?? Please correct, & it would be a 5 star review. Would you mind getting my spells written down saved on iCloud or something please? 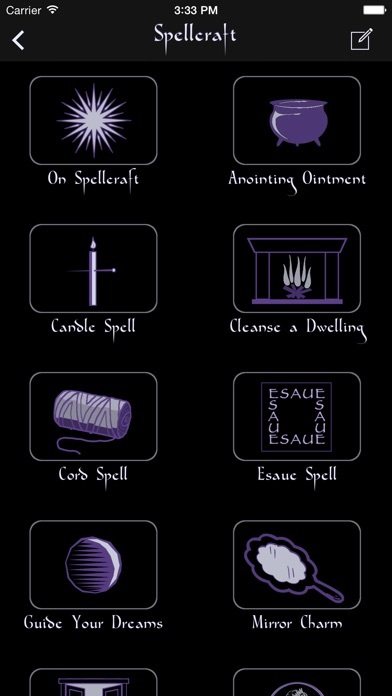 Last time I was restoring my iPhone bit when I did, my spells are gone and now I have to start all over. Please make it save on iCloud or something. Thx! This app is exactly for what I was looking. Well organized, beautifully displayed, customizable, and very detailed. I have been practicing awareness of the law of attraction for the past 3 years. On my vision board has been a lotto powerball win focus. I give specific dates with my heartfelt intention that I already have it. I think about it all the time, all the people I can help with so much money, and give my hubby a break from so many years of working in a profession that makes him unhappy. It is constantly in my mind how awesome it is to win and how eternally grateful I am...I am grateful by nature so this part is easy. I've read a lot on "the craft" which appears to be based on the law of attraction. So after a lot of research I purchased this app. Last night I did the candle spell as it was the night of the next lotto drawing. I gave full faith into the process. I used my goddess bells to summon the goddess. I found a sewing needle that looks like the same length as in the photo and used a small spell candle, a green candle for money. 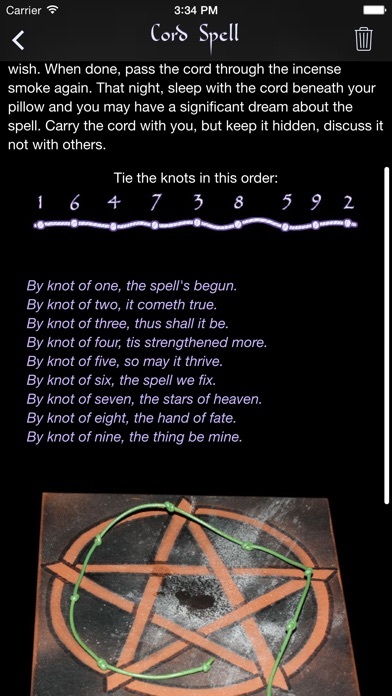 I inserted the needle half way down as instructed and placed it in side the ring of my alter cloth on top of my pentagram amulet and repeated the rhyme. I used a green reiki infused pillar candle to light the spell candle. I also burned cedar wood and patchouli incense. I visualized having the money from the win now. I easily maintained focus on my intended desired outcome...to win last night's powerball drawing. The candle burned down to the needle but the needle did not fall off. Instead, it stayed put as the candle continued burning and melting. I focused long after the halfway point before I realized there was only about 1/4 of the candle left. The needle was still in place as it continued sinking into the wax. At what point is it supposed to fall off? I get the gist that there are a couple of factors involved. The fire is sending the energy of the intent and the needle at halfway mark is a measure of time needed for focus. Believe me...I was sending the intent to that lotto powerball machine! So, I checked the drawing results today...not one number was correct. I've had as many as 3 out of 6 previously. Did the spell fail because the needle did not fall out? It did cause me to focus my desire and intent longer because it didn't fall off. I felt the words of the rhyme...I'm very sensitive to energy, confirmed by my reiki master instructor. Trying to remain hopeful that I did not waste $5 on this app. Amazing if you are just getting started! 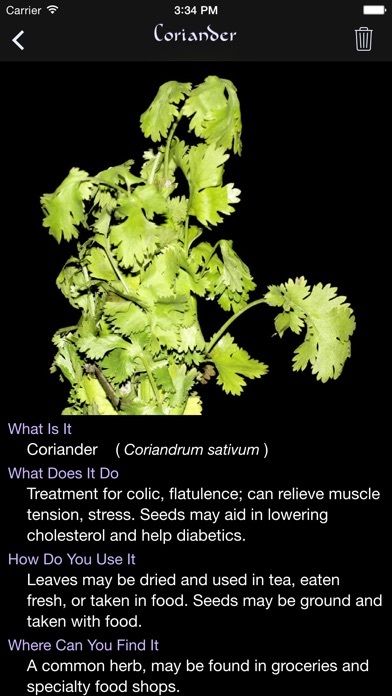 Has loads of information, vastly broadens your knowledge.